The Egyptian hieroglyphs make up over 700 pictorial symbols of Egypt's ancient writing system. Hieroglyphs, which is a Greek word combination, consisted of symbolic illustrations that the Greeks touted as sacred carvings, or the words of the gods. These pictograms and phonograms have been described by medieval scholars as the writing of birds because a number of hieroglyphs depict the likeness of certain birds. Hieroglyphs are words, signs and symbols all at the same time. A single image may denote a sound, a symbol or a concept. The Egyptians used a shenu or a cartouche to encase the Pharaoh's name written in hieroglyphs. The shenu was a protective ring that shielded the pharaoh's name from evil intentions and spirits. Many Egyptian hieroglyphs have not yet been deciphered by experts. These pictures are grouped or used individually, and the groups can be read from the bottom up and vice versa, from the right to the left, and from left to right. The manner of reading depended on the direction of the symbols. A group of hieroglyphs may represent the sound of a word and can sometimes be trailed by a symbol that validates its meaning. Ibn Wahshiya or Wahshiyya, a ninth-century Iraqi alchemist, was one of the earliest scholars who succeeded in decoding the hieroglyphs. He was credited with being able to decipher at least 50% of the hieroglyphic symbols in his many years of study in Egypt. Perhaps his greatest contribution was discerning the purely pictorial signs (ideograms) from the phonetic ones or phonograms, labeling the former determinatives. Ibn Wahshiya's scholarly work on the Egyptian hieroglyphs was finally translated into English in 1806. He was only one of many Arab scholars who studied and attempted to decipher the hieroglyphs from 600 CE (Common Era) onwards. The Arabian intellectuals, many of whom were alchemists, had already studied and deciphered a number of the hieroglyphs at least one thousand years before France's Champollion was tasked with unlocking the message of the Rosetta Stone. 1. For recording economic activities and administrative tasks. Hieroglyphs were used for the accounting of royal estates or localities. They were also vital in noting down traded goods and available commodities. The Egyptians also kept track of descriptions of vessels, their routes and their cargoes. Their writing system was also necessary in recording revenues for collection and taxes for the ruler's budget. Hieroglyphs were precise in preserving administrative institutions, localities, titles, and descriptions of goods and places. 2. For expressing royal doctrines. Serekh is the earliest method used to denote royal status. Hieroglyphs are used in describing serekhs, maceheads, labels and commemorative palettes. The king is symbolically depicted as subduing an enemy as well as participating in festivals. 3. For making funerary documents on stone or wood, also called stelae. In the early Dynastic period, an important aspect of private burials and tombs are stelae with hieroglyphs, intricate carvings and symbols. The stele or stela also itemizes the deceased's titles and particular requests for offerings. The ancient Egyptians devised the hieroglyphic writing system around 5,200 years ago, just a hundred years or so later than the earliest known time when pharaohs began ruling Egypt! Tomb U-j at Abydos, which is allegedly the site of the earliest and most well-known examples of early hieroglyphic carvings on bones and vessels. Carvings on stone from South Saqqara, whose existence dates back to the Sixth Dynasty during the reign of Merenra, ca 2345 BCE to 2181 BCE. This stone is now in the custody of the Egyptian Museum in Cairo. 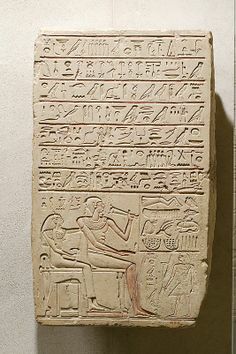 The stela of Sobekhotep, a limestone with beautiful hieroglyphic depictions that was probably created between 1938 BCE and 1755 BCE. You can read more about the power and magic infused in these stelae here. Writings on the chamber walls of the pyramids, among the most beautifully intact found in the sarcophagus room of King Unas. These Egyptian hieroglyphs were made circa 2450 BCE to 2325 BCE. Can't get enough of Egypt? You can also read about exciting info on mummification, Egyptian Pyramids and some more on the ancient Egypt. Their mummification process is also quite interesting. Click here to go back to the Egyptian Symbols page. You can also return from Egyptian Hieroglyphs to the Symbolisms homepage to read more about fascinating symbols.